A standard baseball game is typically played with at least nine players in a single team so that these players could fill up all the defensive positions on the field during game play. However, in some cases, certain league rules allow a team to play with 8 players. Playing with 8 players is somewhat different because the total number of defensive positions on a baseball field is 9. So a team with 8 players has to position itself in such a way that all defensive positions are covered and the batters are not given any extra gap through which to hit. So in an 8-player baseball team, there are 8 players and 9 baseball defensive positions to fill. This is where the creative abilities of the coach come in. An 8-player team has to adapt as best as it can to ensure that all important defensive positions are covered so that the opponent team is not able to take advantage of one less player. This can be done by tweaking the placement of the players on Short Stop and Second Base positions by having them stand deeper than usual. 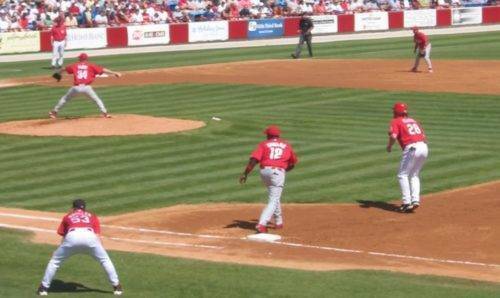 At the same time, 2 outfielders rather than 3 can be used to adjust the lack of one player. When you have 8 players and you have to mount an effective defense on a baseball field, it really depends on what kind of game you are playing and how strong is your opponent team. For example, if you get a power hitter during gameplay, you can change the configuration of the players on your team so that the shortstop is positioned to become the third outfielder. When a player who is not a power hitter comes to bat, you can bring back to the shortstop to his regular position and leave the outfield with two players. In this way, the 8 players can be adjusted and rotated on the go during the game depending upon the kind of hitter who is on batting. For the coach, this means that he has to keep a close eye on the situation of the game and nature of the hitter. When a batter comes on the plate, you have to see his batting style to analyze where he is likely to hit. If he is likely to hit into the Right Field, you can use two outfielders at Left-Center and Right-Center positions. You can further move the player at Second Base slightly deeper so that he is in shallow outfield. This will cover such a hitter’s possible shots. Conversely, if you have a hitter who is likely to hit into Left Field positions, you can similarly move the Short Stop player into shallow outfield along with the two Outfield players behind him in the aforementioned positions. As mentioned above, there is no definite strategy of playing with 8 players. It all depends on the batter, the situation and the ability of the defensive players. If your 8-player team has to face a power hitter who can really swing it hard, it may be time for you to move Third Base closer to the Short Stop position and take the Short Stop player into the Outfield to guard the Center Field. By putting three players out of 8 into the Outfield positions, you will be weakening your position inside the diamond. But when a power hitter comes who can hit hard and far, you may have no other choice but to follow this configuration. Having 8 players, compared to 9 players, is a disadvantage. The one place where you are most likely to be affected due to having one less player is the Outfield. In all probability, you will have to use 2 rather than 3 players in the Outfield. If you are able to adapt in real-time and continuously adjust the positions of your players, depending on the batter, you will most likely cover up the disadvantage and even the odds. As mentioned above, you will have to be very attentive towards the situation and the hitters in order to do this. Failure to do so will put you into a weak position at the Outfield and hitters on the opposite team can easily take advantage of that. At the end of the day, playing with an 8-player team is a challenge but for someone who can make smart decisions on the field, it is about making every available player count at every moment in the game. So an 8-player game is truly all about team play where all defensive players have to put a joint effort in order to play the part of the 9th player as well. For a team that has a good coach, can bring together a solid team work and is dedicated, playing with 8 players is nearly as simple as playing with 9 players.